There’s a bit of a grumble going around the internet at the moment in regards to DICE’s Star Wars: Battlefront and its AT-AT walkers, which will apparently be on-rails. If not being able to direct your walking metal fortress in a specific direction annoys you, then perhaps this Arma 3 mod is for you. 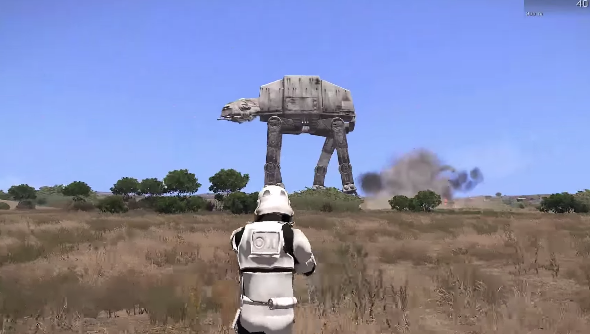 It slams a colossal AT-AT in your game, and it looks glorious. The video, created by user McRuppertle, shows the first in-game test of the AT-AT, and it’s impressive for a first attempt. Unfortunately, the project won’t be going forward. DICE, you’re our only hope. If your AT-ATs are self-driven, then so be it, but make them awesome.